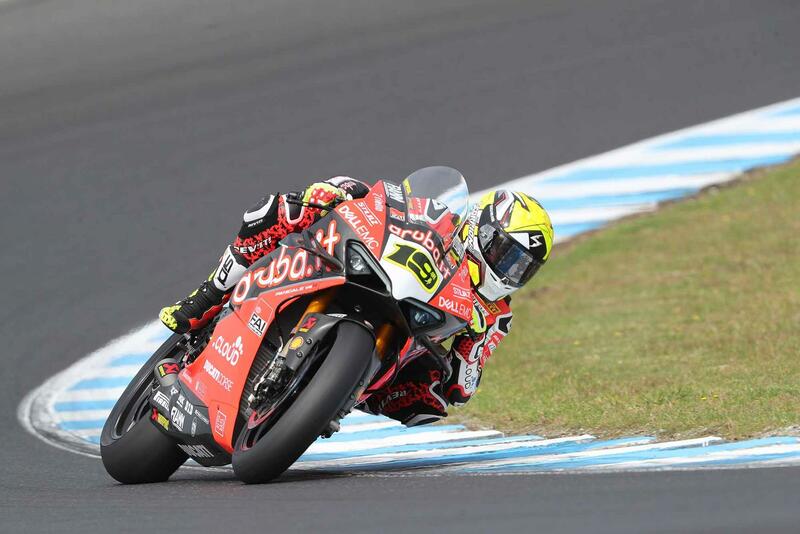 World Superbike rookie Alvaro Bautista has shot to the top of the timing sheets on the opening day of the 2019 season at Phillip Island, Australia, with a 1’30.327 lap. 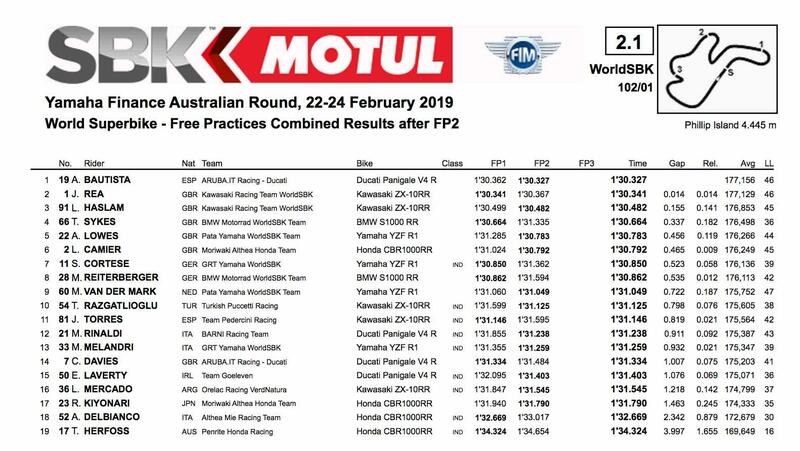 In the combined results after two practice sessions, the Aruba.IT Racing Ducati Panigale V4 R rider finished 0.014 seconds clear of the rest of the field, with the top 13 riders split by less than one second. Kawasaki’s Jonathan Rea ended the day second and set his best time of 1’30.341 in the first stint, which was also the fastest lap of the session. He was followed home by teammate, Leon Haslam, who finished just 0.155 seconds down on his return to the championship after clinching the 2018 British Superbike crown. Haslam has previously enjoyed success at the Australian round of the championship, last winning here in 2015 onboard an Aprilia RSV4. Behind Haslam came the first BMW of Tom Sykes, who makes the switch to the German manufacturer after a successful stint alongside Rea at Kawasaki. Like Rea, Sykes set his best time of 1’30.664 in the first session – putting him 0.337 seconds down on the fastest time. Next came fellow Brit Alex Lowes, who’s time of 1’30.783 was enough to bag his Pata Yamaha fifth spot overall. Following him across the line was Leon Camier, snatching sixth on the Moriwaki Althea Honda Fireblade. His teammate, Ryuichi Kiyonari, was one of the early improvers of the second stint, however crashed towards the end of the session. Rounding out the top 10 was Sandro Cortese, Markus Reiterberger, Michael van der Mark and Toprak Razgatlioglu. Bautista's teammate Chaz Davies was able to set a time of 1'31.334, which was enough for 14th position.